Do you know it defies belief, when every man woman and child in this country is putting their best foot forward to recover from our economic woes that the government pulls the rug from under us, yet again. This time its one of those ‘jobs worth’ moments when the NRA (National Roads Authority) have simply removed an iconic sign that has been standing at the crossroads in Ballyvaughan for over 30 years. Possibly the most photographed road sign in Ireland, as one protester rightly put it, more ‘folk art’ then actual road signage. It is located along what Conde Nast has described as one of the Top 10 road trips in the world, out to Doolin via Blackhead. But the NRA obviously don't want you to go there. Let me introduce you to the latest great waste of money in Ireland - the new system of 'navigating by numbers'. 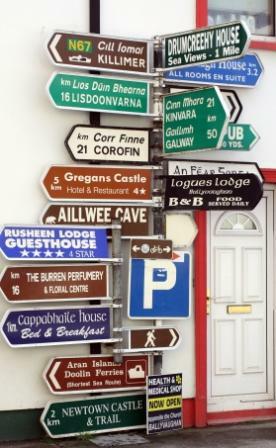 Apparently the powers that be are spending 60 million euros on new road signage in Ireland. So, we now have complete dead-end boreens grandly renamed as the L150001 or whatever. Why? Who cares? The answer: nobody. Locals know where they live. For crying out loud in this day and age of smartphones, using inbuilt satellite technology and tracking, only in Ireland would we be spending a fortune on misleading the tourists. If it wasn’t such a serious waste of money it might even be funny. but this is money that would be better funding tourism initiatives like my own and countless other small businesses who are trying to encourage not discourage visitors to Ireland. And, okay we dont want you to get lost but its a very small green island, how lost can you get? You can Like the Return the Ballyvaughan Sign Facebook page here.